The stats of Excitement, Fear and Nausia essentially determine whether guests will ride your rides, and in the case of Nausia whether your guests need to visit a First Aid station afterwards. These explanations are based on personal observations - your results may differ. Excitement on coasters seems to be based primarily on the intensity of G-forces, particularly vertical G-forces relative to the train. 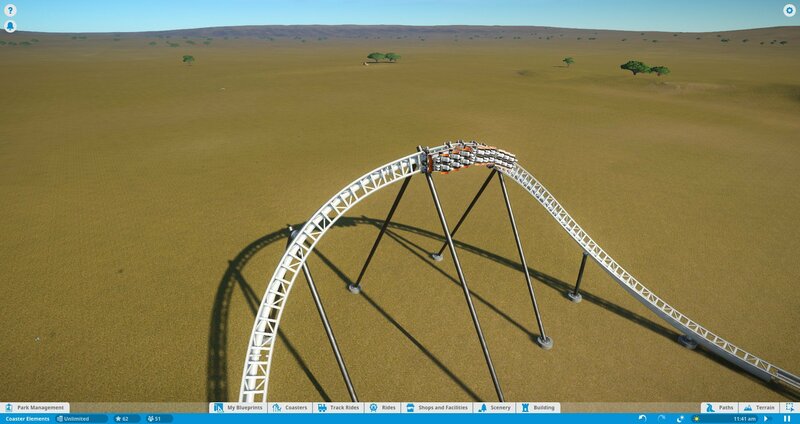 Usually, the higher the G-forces, the better, but if you go too high the ride becomes uncomfortable, which causes the fear stat to increase instead. The higher you go in this stat, the better. Fear on coasters seems primarily based on sudden movements and excessive G-forces, although I've also noticed a trend with sideways G-forces generally increasing fear. Some fear is desirable, but don't overdo it. I've noticed that two things increase nausia - back-to-back intense elements and sharp vertical drops. It's a good idea to have "breather" sections between elements so that people can recover from them. You want this stat to be as low as possible, though it's not as big of a priority as Excitement or Fear since there are ways to mitigate the effects of a high-nausia ride. Make sure the ride isn't stacking. Stacking is when trains sit on the brake run due to slow operations. 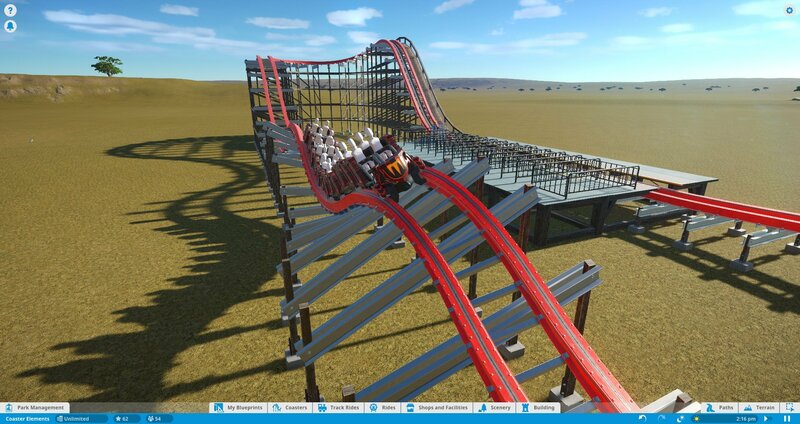 To fix this, reduce the number of trains or adjust the speed of your lift hill. If you have "don't block station" enabled, you might also want to expreiment with the timing. The train is going too slow through a section of the track. Watch the train's speed through each section of the ride. You might have an airtime hill that's too tall or a trim brake set to slow the train down too much. You can also use the hotspots view to see where these problem areas are. Your fear/nausia stat is too high. While I can't confirm this directly, there is evidence to suggest that if your fear and/or nausia is too high, it reduces your excitement stat. Use your hotspots view to see where the problem is. If your Fear or Nausia stat is too high, there are a few things you can do to fix this. Your ride isn't smooth. The smooth tool is your friend. Use it. Sudden changes in G-forces. You need to make sure you're not just throwing the ride around. Smooth transitions between elements are key - don't make yet another Mind Eraser. Too high of speed for a specific element. 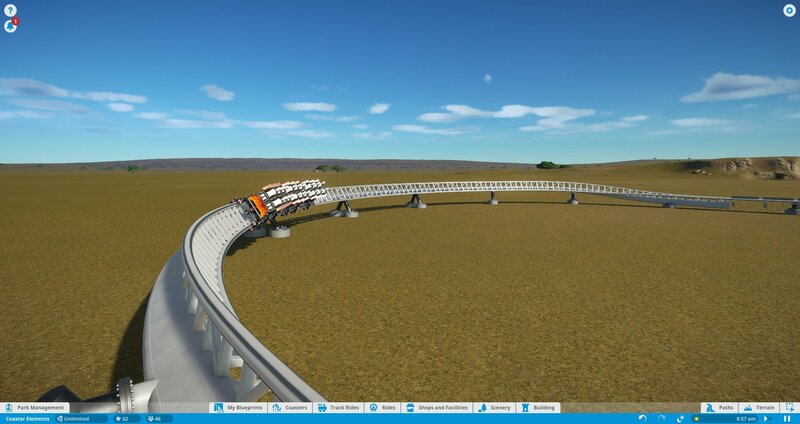 While you do want to maintain a good pace, you don't want to throw the train through a tight, reverse-banked turn or cobra roll at high speed. Certain elements need to be treated with care. The basics - what is airtime? Airtime is a moment of negative vertical Gs, which gives a sensation of weightlessness or even being lifted out of your seat. 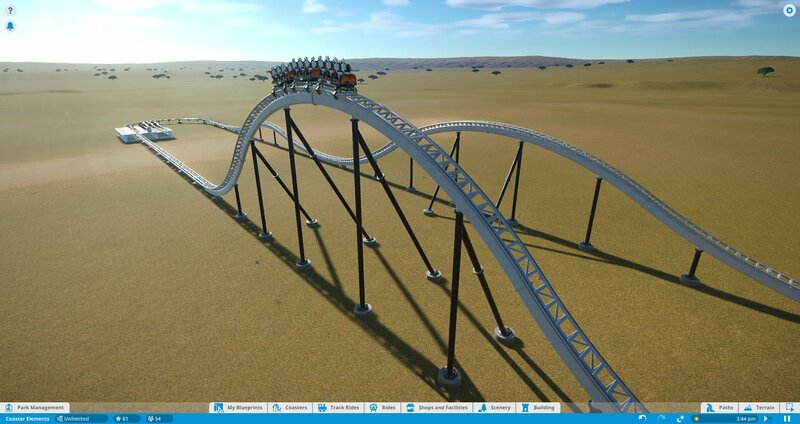 In general, if your coaster isn't focused on positive vertical Gs, it's focused on this. There are several ways to get airtime, which will be covered below. This is the most simple form of airtime element. It's a hill that the train travels over to induce negative vertical G-forces. Generally, the faster the train is moving, the larger the hill should be. 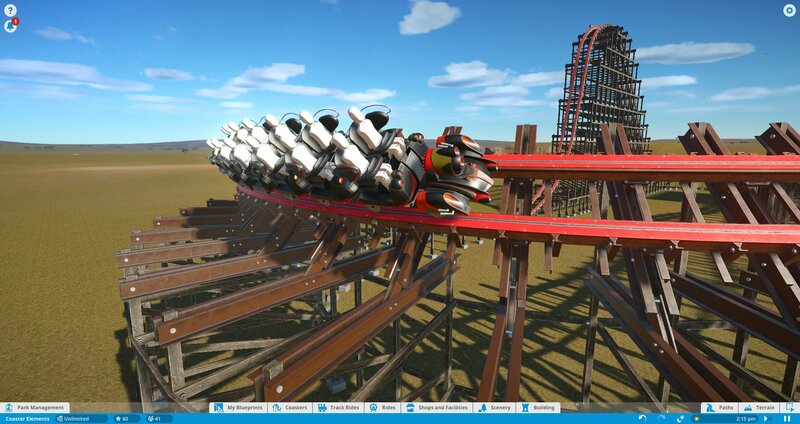 Smaller hills at higher speed induce more extreme airtime, and exceeding -1Gs induces what's called "Ejector" airtime. 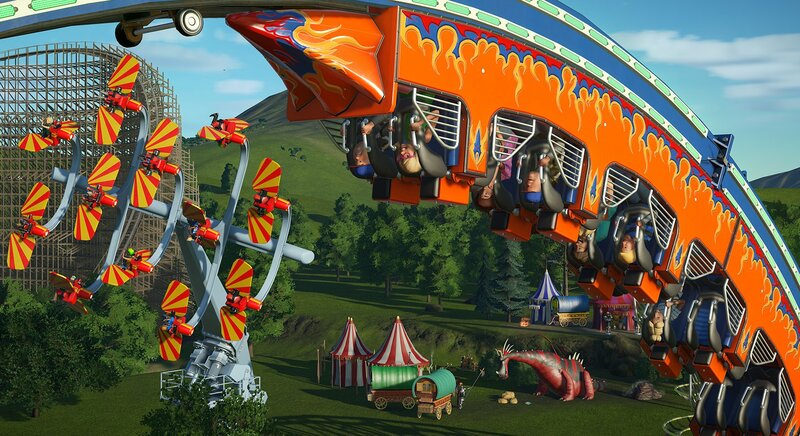 However, for gameplay purposes, airtime is airtime. Simply put, these are airtime hills with additional rises or drops along the path of the hill. More or less an airtime hill, but with a bit of lateral Gs thrown in. 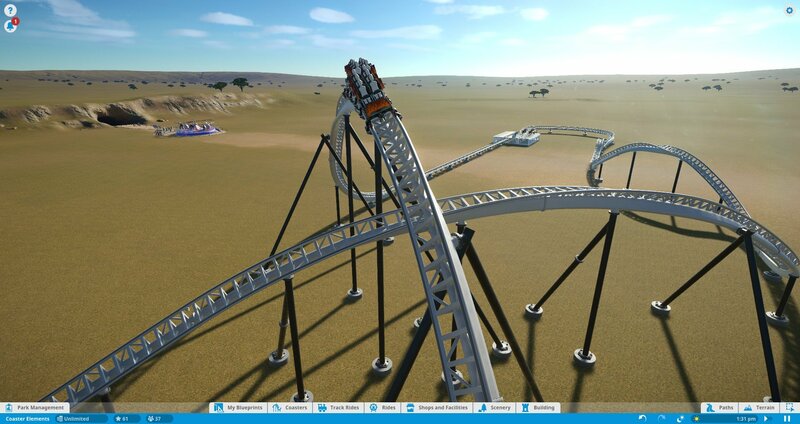 This is a good way to chain turns into airtime hills for a more intense ride, but be careful not to overdo it. If you have a steep pre-drop, you can approach the drop with a decent amount of speed. 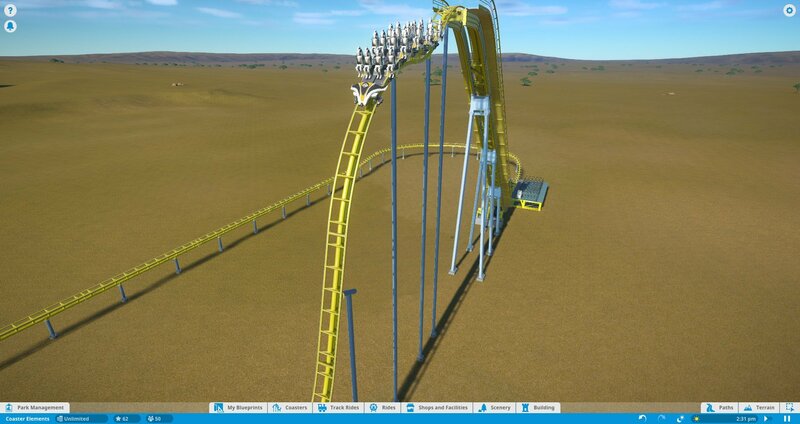 Doing so lets you induce airtime using the top of the first drop itself. 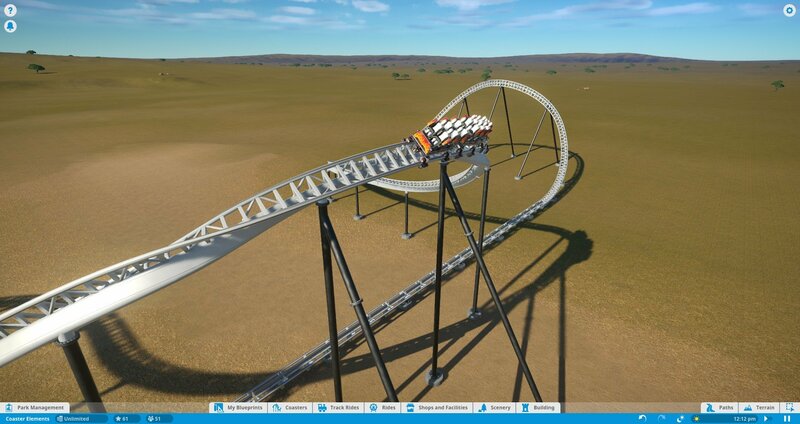 You can also achieve this by using a faster lift hill. Seen primarily on launched rides, these elements are basically 180-degree airtime hills. You can enter them and exit them from multiple directions as well, as the aproach and exit can be twisted to suit your needs. 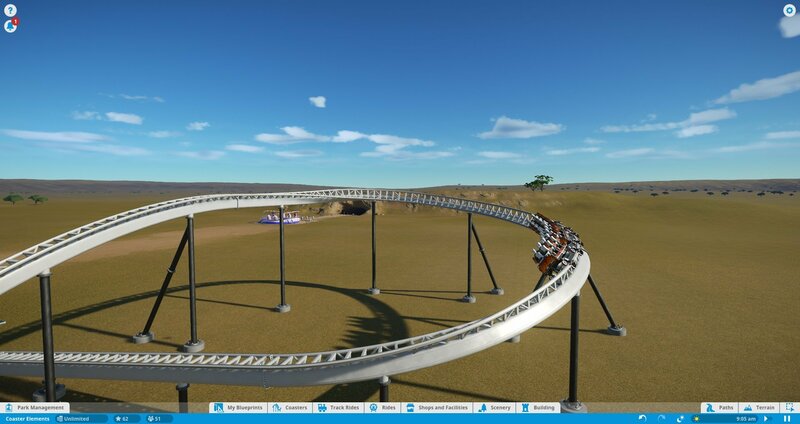 Ok, I honestly don't know the real name for these, but essentially these are small airtime hills where one rail bumps up higher than the other. Part turn, part airtime hill, these elements are most often seen on hybrid wooden coasters. 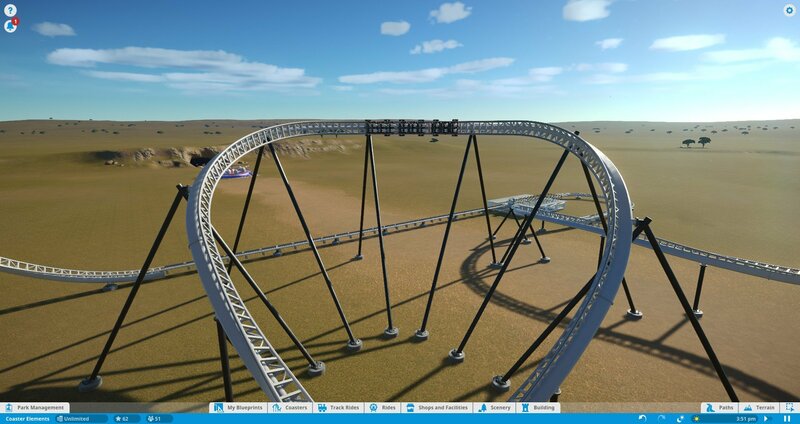 Great for inducing airtime when you need to make a turn. Don't enter this too fast, as these induce lateral Gs as well. 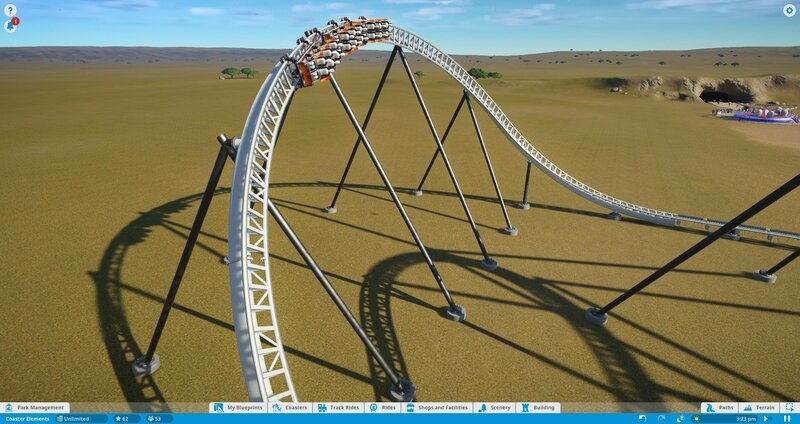 Basically, a small airtime bump in the middle of a wave turn. Introduced by Lightning Rod at Dollywood. Can also induce lateral Gs, so watch your speed. You'd think that something like this would be simple, but it really isn't. At high speeds, a flat, unbanked turn will induce high lateral Gs, which you don't want. Properly banking your turns is VERY important as it reduces lateral Gs and makes the ride more enjoyable. The turn pictured here is banked at 60 degrees, and as a result the train can travel through this section at 60MPH with minimal lateral Gs. Plus, the positive vertical Gs help to maintain excitement through the turn. Like I said, it's important to bank your turns. Simply a longer banked turn with a slight elevation change. Best used when you need to turn in the opposite direction, but the train is moving too fast in the opposite direction. 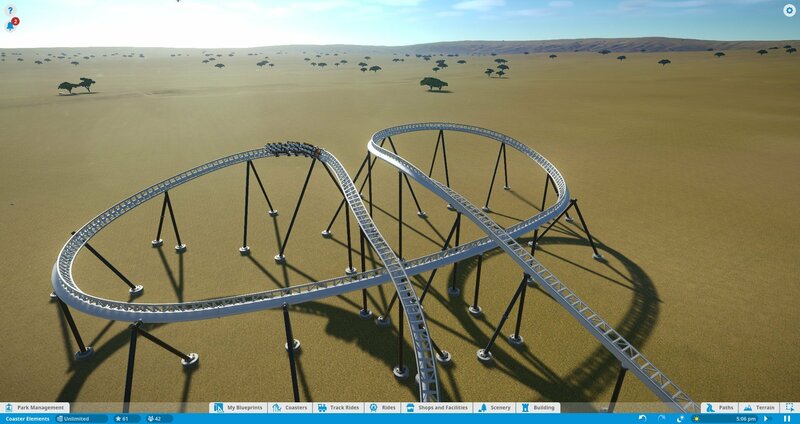 With a steep enough bank, this can also function like a loop on some non-inverting coaster types. Imagine you're surfing, and you ride up the face of a large wave. That's basically the same motion as a wave turn. Be somewhat careful with these, as you're technically not banked relative to the turn itself at the apex. When a turn exceeds a 90-degree bank, it becomes an overbanked turn. 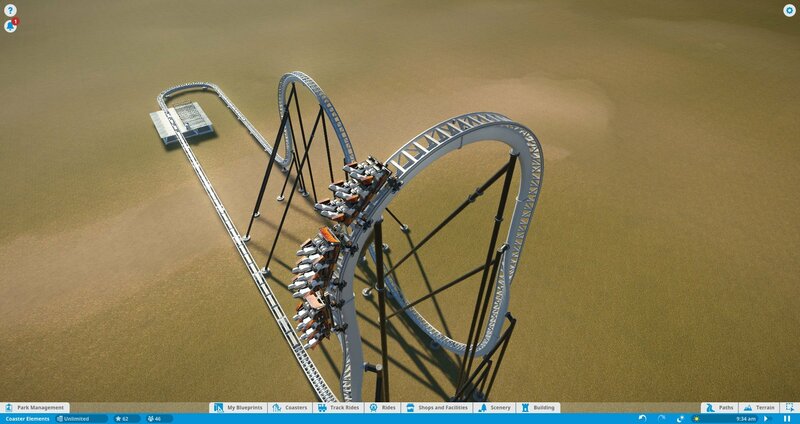 A good way to induce positive Gs on hypercoasters and gigacoasters, and the go-to turnaround for B&M Hypercoasters. Basically an elevated banked turn. Has a "barrel" shape to it. Pretty much a turn that's banked outwards rather than inwards. Be VERY careful with these - they're a good way to induce negative vertical Gs, but they also induce a lot of lateral Gs. Basically, two big helixes joined together. Really not much to say about this. A monster of an element. At the bottom, a healthy portion of positive Gs. At the top, essentially a second drop. 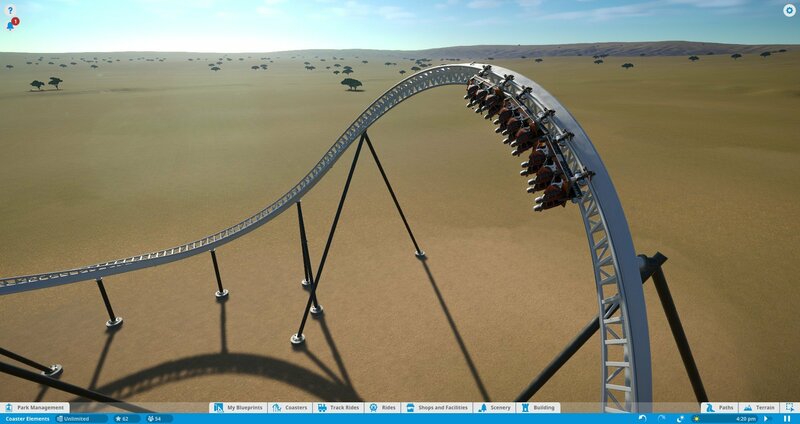 A good, creative way to turn an out-and-back Hyper or Giga around. 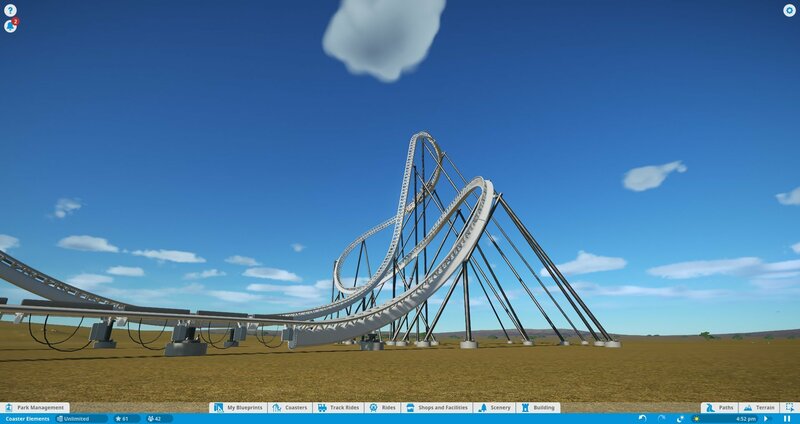 Could also be a good addition to a launched coaster.